Tough in the Field. Fast Everywhere. 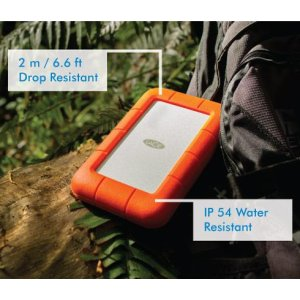 With the LaCie Rugged Thunderbolt, even if you go off-road, your project stays on time. With IP 54-rated resistance to the elements and blinding-fast speeds through Thunderbolt and USB 3.0, you don’t have to compromise between durability, mobility, and speed. Get lightning-fast transfer speeds on Mac and PC thanks to the USB 3.0 and Thunderbolt interfaces. 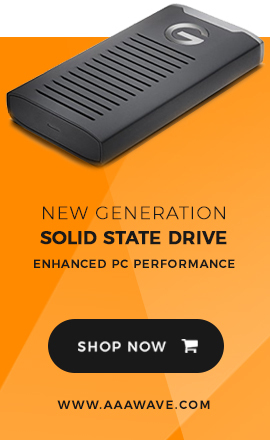 With the SSD version, the LaCie Rugged delivers up to 387 MB/s—one of the fastest bus-powered products available*. The hard disk version performs at up to 122 MB/s, a 35% improvement over FireWire 800. Back up and transfer mountains of data in a fraction of the time. Enjoy noticeably more responsive photo library browsing. 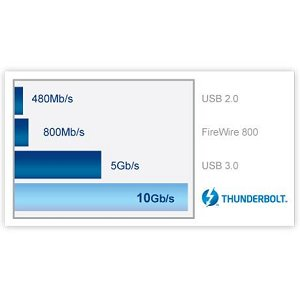 *These transfer rates were achieved using AJA System Test with the SSD version connected to a Mac computer via the Thunderbolt interface. Actual data rates may vary depending on operating environment and other factors, such as chosen interface and disk capacity. Don't let your project get derailed by incompatibility between your external drive and your computer. With both USB 3.0 and Thunderbolt interfaces, the LaCie Rugged is a perfect match for your Mac and PC. Since USB 3.0 is backward compatible, you can connect it to any standard computer, anywhere. The integrated Thunderbolt cable also stows neatly when not in use, so that you’ll never lose it. 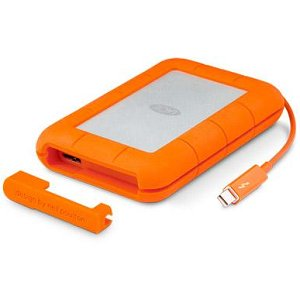 The LaCie Rugged is also fully bus powered through the USB 3.0 and Thunderbolt cables. Its portability and interfaces make it the must-have sidekick to a Mac or Ultrabook. Your data is irreplaceable, so it’s vital to protect it against any conceivable mishap wherever you go. That's why LaCie made the Rugged tougher than ever. It’s MIL-compliant, which means that data is protected even during accidental drops of up to two meters (6.6 feet). During transit, connect the removable cover to provide IP 54-level protection against dust and water. Whether the LaCie Rugged falls out of your backpack or gets splashed by a mud puddle, you stay confident that your data is still accessible. The SSD version goes a step further for the ultimate in resilience against vibration and shock. Both versions are tough enough to be shipped for reliable delivery to clients or partners. Included software even protects your files from prying eyes with AES 256-bit encryption. Easy setup and automatic worry-free backup for both PC and Mac computers. LaCie Private-Public software* (available via download) ensures your files remain completely confidential. You can connect this product to a Windows computer via the Thunderbolt connection. Enhance your warranty with extended coverage and fast product repair or replacement.